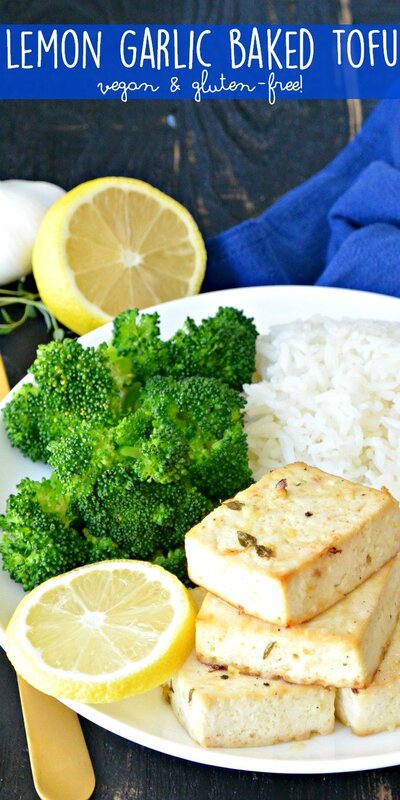 Lemon Garlic Baked Tofu is a flavorful recipe that’s easy to make. It’s naturally vegan and gluten-free. Enjoy it with your favorite grain and vegetable for a healthy meal. I used to love watching cooking shows on Food Network. But I got out of the habit after becoming vegan since most of the shows focused on recipes involving meat. However, the other day I stumbled upon an episode of Barefoot Contessa. She was making a chicken dish that involved far too much salt and oil for my taste, and of course I don’t eat chicken anyway. But what stuck in my mind was the delicious combination of lemon and garlic. 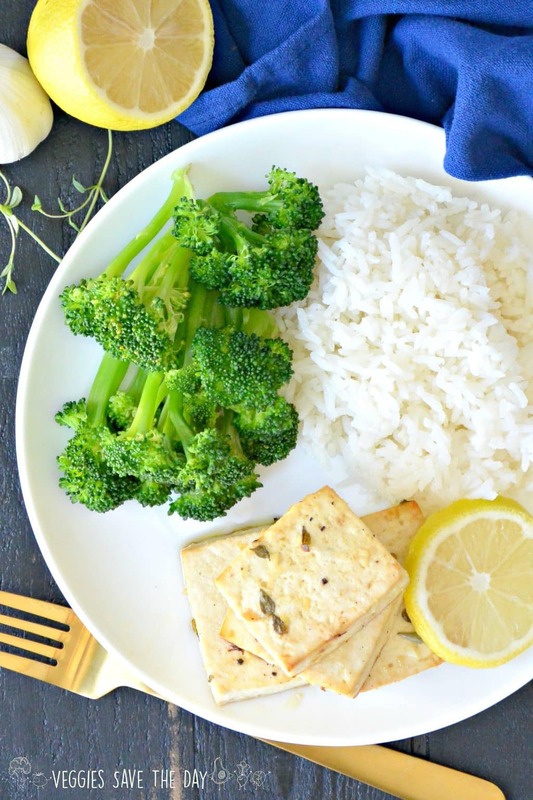 Baked tofu is an easy way to prepare this versatile protein. First it’s important to press the tofu to remove the excess liquid. I use the EZ Tofu Press shown in the above photo. It’s amazing to see how much water comes out from even extra-firm tofu in just a few minutes! 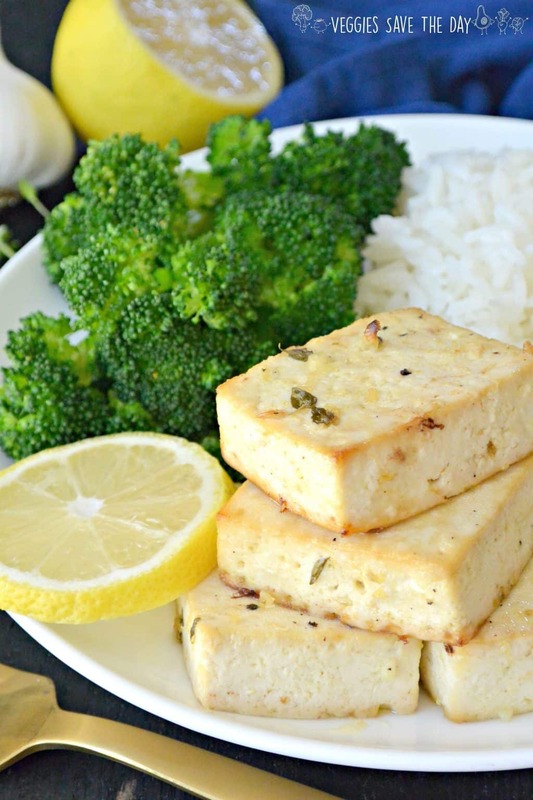 While the tofu is pressing, you can prepare the simple marinade for the Lemon Garlic Baked Tofu. Then it’s time to let the tofu marinate to absorb all the delicious flavors. I recommend at least an hour, but overnight is even better! And I think the tofu tastes even better the next day! I recently enjoyed some for brunch with Roasted Breakfast Potatoes. I reheated the tofu in my air fryer for a few minutes. But for dinner I like serving this baked tofu with a grain and a vegetable. Rice and steamed broccoli are always a favorite. And if you’re looking for another baked tofu recipe, you may also enjoy the Breakfast Tofu from the No Meat Athlete Cookbook. It’s delicious any time of day, not just in the morning. 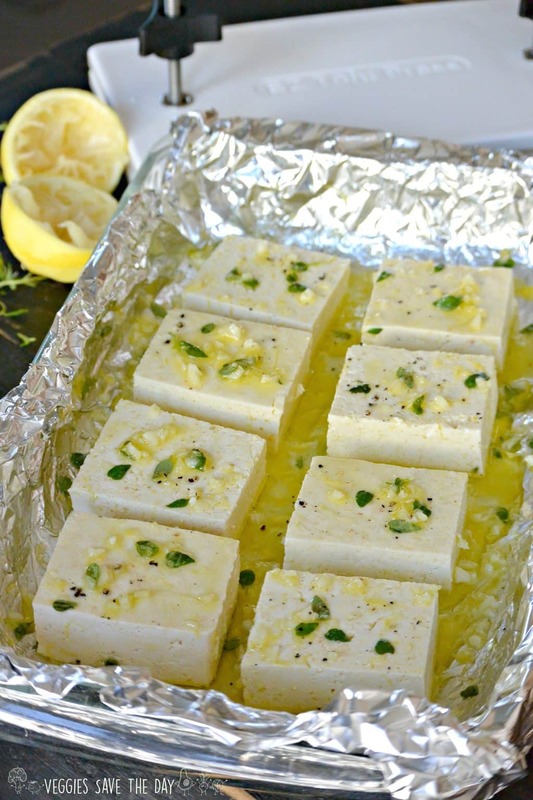 Now let’s make Lemon Garlic Baked Tofu! What is your favorite way to enjoy tofu (stir-fry, tofu scramble, breakfast casserole, etc.)? What is your favorite plant-based protein? Line a baking dish with foil (for easier clean up). Press tofu (I recommend the EZ Tofu Press) to remove excess liquid for about 15 minutes. While the tofu is pressing, add the olive oil, garlic, lemon zest, lemon juice, thyme, and salt and pepper, to the baking dish. Cut the tofu into 8 pieces. Coat both sides of each piece of tofu in the marinade. Place the tofu in the baking dish, then cover and refrigerate for at least an hour or overnight. Bake the tofu in a 375 degree oven for 40 to 45 minutes, flipping the tofu places half way though. If you have time, I recommend marinating the tofu overnight to make it extra delicious. Be sure to zest your lemons before juicing them. I use a microplane. Ooh this looks so good! You know how I love tofu. Looks DELISH! Do you cover the pan while it is baking? Thanks Melissa! No, you leave it uncovered. Lemon and garlic are so yummy together. This looks delish! Thanks Dianne! It’s one of my favorite flavor combinations. I am drooling over here, this looks SO good! Yum! This looks like such a nice, simple dish. I’ve never tried lemon or garlic on tofu. I can’t wait to try this. Thanks Jenny! I think you’ll enjoy it! Huge lemon and garlic fan here! This sounds so good, and I love how easy it is. For real, I miss eating tofu, haha! (Probably the only person to have ever said that!) I would be whipping up so many fun dishes if I could still have it! I love a good tofu recipe and this one seems easy to make and a very delicious one! Can I add lime zest in addition to lemon zest, Amy? This looks delicious! Do I bake the tofu in the marinade? Thanks Pat! Yes, that’s exactly right. I made this for dinner last night. It was delicious! I only used 3 table spoons of olive oil and think I could probably get away with 2. Just trying to cut calories where I can. Super yummy! Thanks Patty! This is good to know. I’ll have to try it with less oil the next time I make it. I absolutely love this recipe! 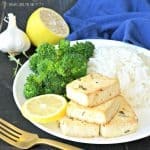 I’ve been making a point to cook more in 2018 and I found this recipe for tofu really easy to make and throw into rice bowls or with pasta and broccoli. I’m so happy to hear this, Aly! Thank you so much for leaving a comment! Thanks for posting this recipe! I just made a pretty close approximation (I didn’t measure… just kind of eyeballed it, didn’t have fresh lemons so I had to skip the zest and use bottled lemon juice, and added lemon pepper seasoning cause I have a massive jar of it) and it’s so good that I keep slowly picking away at it like a little vegan bird. There isn’t going to be any left for my lunch tomorrow! Good stuff! Thinking about adding it in next time a make some chickenless noodle soup too… So, again, thank you! I’m so glad you enjoyed it, Vikki! I’m going to remember the lemon pepper the next time I make it. That sounds like a delicious addition. Thank you for trying the recipe! I. Love. This! It’s so delicious. I added a bit extra pepper for a strong lemon pepper flavor, didn’t use any oil for the tofu or salt. I made cauliflower “rice” in my food processor. I did use a tablespoon of olive oil and a sliver of ginger to saute baby bok choy. It tastes great and I have no guilt about getting seconds. Great recipe! Maybe it could have used less oil, as a comment said. But everyone liked it so much that I’m afraid to mess with it! Will definitely make it again, we (3 adults) finished it off in one night, wish I had made double. Served it with broccoli and buckwheat, a great combination w/the tofu.